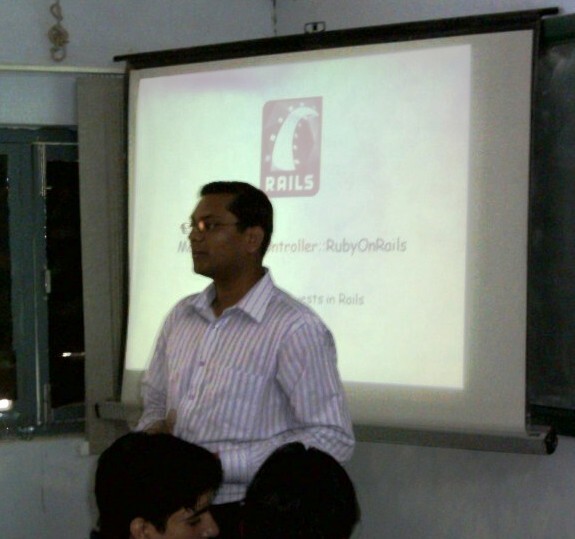 Two weeks ago we went to DEI(DayalBagh Educational Institute) to present Ruby and Rails. We also had a whole day workshop there. It was really a big fun. We (me and my colleagues Sur & Hemant ) enjoyed it very much. People (students of M.Sc, PGDCSA and course coordinator) were very interested in Ruby and Rails. These students had already worked on PHP/Perl. First day sur presented Ruby basics then I gave a brief introduction of Rails and MVC Architecture. This was my first ever public presentation. I was feeling very nervous while starting but later I felt comfortable. Afterward we had ActiveRecord Basics by sur, me on ActionController and ActionView by Hemant. Next day in workshop we planned to get tada list done by students but due to some time constraints we could not finish tada list completely . Students were confused in starting but later on they got interest in the application. After the workshop they were amazed how easily things can be done as comparing to PHP/Perl. I should say thanks to Ritu for taking initiative for this presentation and workshop. She was also supposed to go there but she couldn’t go. Its very nice to hear that vinsol has taken a step to acknowledge the students of an emerging institute about the technology to develop websites like rails. to organize such type of seminars would be benificiable for the students have an interest in software technology and also for company as by this way it is approaching to the roots of advertisements.